Is a revolution in access control readers upon us? That's the claim of one manufacturer, who has introduced a line of readers that can read standard credentials up to 6 feet or more. While that itself is not new, they are emphasizing the reader's small size. In this note, we examine Nedap's uPass reader to see if a revolution is truly at hand. Standard proximity readers require the credential to pass just a few inches in front of the reader to be read. For many applications, this distance is satisfactory and even a security measure in itself, since video surveillance systems are trained to record areas immediately surrounding a card reader. Regardless if the holder is approved or denied, all activity involving the reader is recorded, and long-range attempt to exploit the reader cannot occur. Vehicle Gates: Readers in this application need to be able to register tokens or stickers mounted on windshields from feet away, not inches. Delivery Doors: Carrying or wheeling packages in by hand means setting packages down when a card is presented. Long-range readers can pick up on credentials hung from lanyards or loops with breaking stride. Hospital Corridors: Long range readers allow doors to be opened well in advance of the hurried arrival of hospital 'crash' carts through clinic doors. The unit measures 2" wide by 6 " tall and just over 1.5" deep, making it much smaller than comparable 'long range' readers. Range: The unit can read credentials up to (conservatively) 6 feet away. However, on the show floor demo unit, successful reads up to 15 feet away were being registered. The manufacturer states the conservative '6 feet' value as a guaranteed minimum, regardless of outside interference or environmental variables. 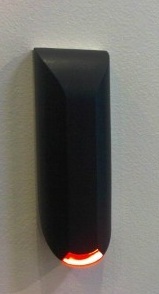 Small Design: Nedap states the uPass Access' expanded range due to an unique antenna design and more powerful radio than other comparable offerings from other manufacturers. However, the uPass is designed to work with typical 12 - 24 VDC power. Non-proprietary format: The uPass Access is able to read standard RFID credentials: HID, Mifare, EM, and Nedap cards and send output in standard Wiegand, magstrip, and clock data formats. This means that uPass is a 'drop in' replacement or addition for major EAC systems. Price: Nedap's uPass Access has an $600 MSRP, with an expected street price of $530 expected through distribution. While the new Nedap reader costs $100-$150 more than existing long range readers, the smaller form factor can significantly reduce installation cost and complexity in certain conditions. For instance, installing the reader on hollow metal door frames makes for quicker work in fishing control wires than through filled concrete walls. In such instances, the installation could be hundreds of dollars more for wall-mount readers rather than a quick mullion install. Furthermore, if mounting space is tight or aesthetics is a premium, Nedap's uPass higher cost may ultimately solve the problem less expensively. 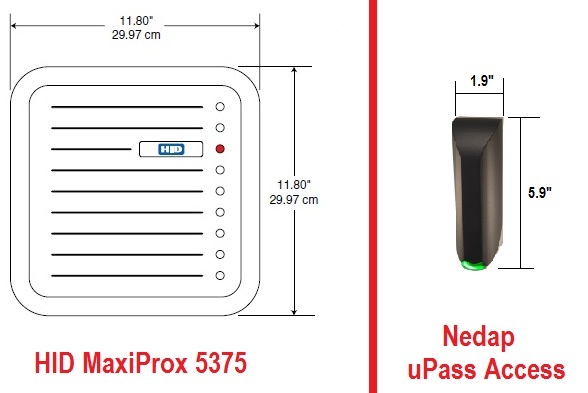 While it's not a 'Revolution' like Nedap claims, the uPass Access reader's small size and long read range are unique and useful in tight or difficult applications.